This 45-year-old patient came in with a fractured tooth. We presented the patient with all of their possible treatment options: root canal therapy, crown lengthening + crown, or an extraction and placement of a dental implant. The patient elected to extract the tooth and to replace it with an all-ceramic metal-free dental implant. 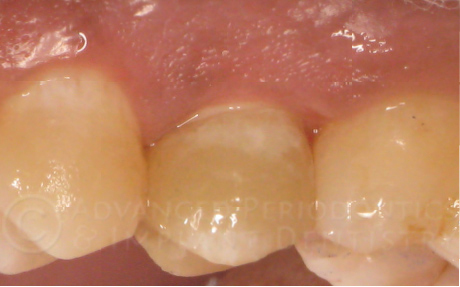 The patient’s problem tooth was atraumatically extracted and an all-ceramic metal-free zirconia implant was immediately placed in the same visit. After the healing period when the implant integrated into the jawbone, the metal-free implant was fitted with a zirconia crown. The patient was completely restored to function and was highly satisfied. Zirconia implants are 100% metal-free treatment alternatives to titanium implants. 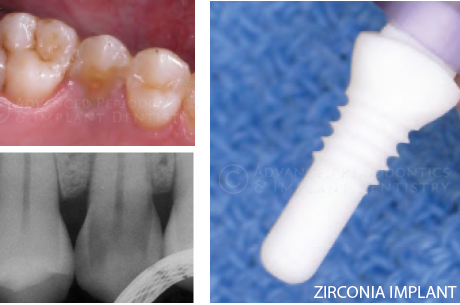 Zirconia is an all-ceramic material that has been widely used in restorative and implant dentistry. Zirconia implants have enjoyed high success rates in Europe for over 15 years. More recently, they have been introduced in the United States market and are quickly gaining favor among practitioners and patients who may not want metal devices in their bodies and/or have titanium allergies. The zirconia implant offers all the desired properties of titanium implants, including excellent strength, biocompatibility and osseointegration. The all-ceramic implant, abutment and crown also offer a highly esthetic treatment in which a metal collar will never be visible above or through the gum line. Whether due to a metal-allergy, sensitivity, a desire for a natural material and/or purely for aesthetics, we provide zirconia metal-free implants as a treatment option to our patients. Call us for a free consultation to find out if Zirconia implants may be the right choice for you.